High-end Design with 2pcs 42mil IR Array LEDs,super clear night image quality. Ball part with metal material and water resistant rubber, the IP Degrade up to IP67, has been tested underwater for 72 hours for waterproof function. Flexible casing with Anti-corrosion PVC material made the dome camera can be installed both ceiling and Walling. 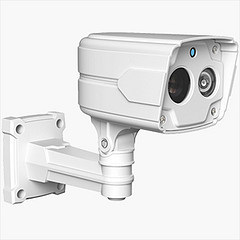 The best selling small size IR bullet camera. Private design with 36pcs IR LEDs,beautiful image quality with Aptina 1000TVL. Metal housing with cable built-in ceiling bracket. Two unique designs with a same size not only the housing but also the brackets made them the series more vivid_Armor Series. Metal materials made the cameras looked like two Armored Warriors symbolized they are just for security . Model no.8810M installed with 30pcs IR LEDs,for the night vision within 20m IR Distance. Model no.8811M installed with 2pcs IR Array LEDs, for the night vision with 20-30m IR Distance. See the videos below, they are with Aptina 800TVL,compared with the Aptina 1000TVL, they are not really bad at all .